Mmm donuts (in a not-so-good, but oh so applicable Homer Simpson voice)! Ok so we all know donuts as coffee’s OG soul mate and the reward our parents would buy us after class if we passed a big test or didn’t get in trouble or just survived church without throwing a fit. Simply put, donuts are a reliable hit of happiness, a bite of nostalgia and a full circle lesson in immigrant entrepreneurship deeply woven into the fabric of Los Angeles. “If you look into the background of donuts, it is mainly made up of Cambodian families,” says Donatsu co-owner Jenny Ban. California Magazine estimates 1,500 donut shops across California are primarily run by Cambodian families, an extraordinary legacy Jenny doesn’t take for granted. Jenny’s husband, Nite Ban, is Cambodian and his family’s deep ties to the donut business here in L.A. motivate them to both preserve the tradition while throwing their own modern spin on the much-loved, palm-sized fried dough cake. 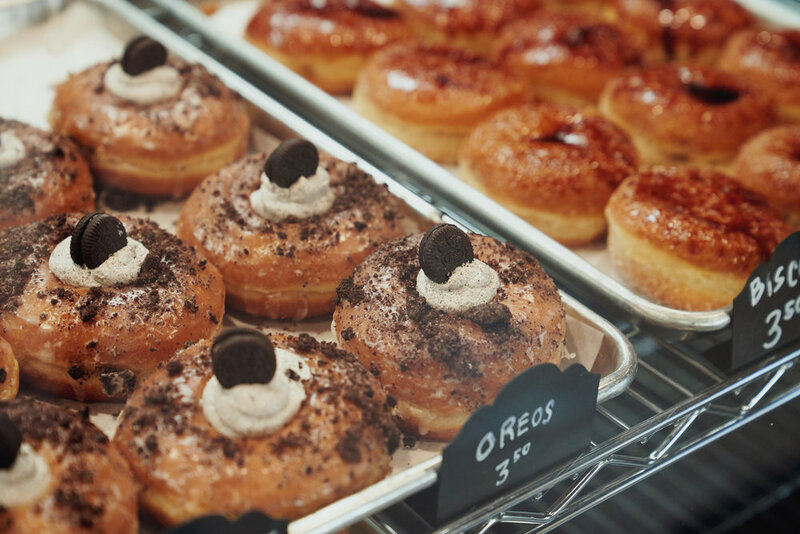 Since Donatsu opened its doors in January, Jenny and Nite have been dedicated to thinking outside of the donut box when it comes to creating fun flavors for a new generation to devour. Their donuts are vegan and look just as good as they taste. “We wanted to be different because there are competitors everywhere. We wanted to be innovative and offer different flavors. When you bite into our donuts we want you to think of us when you try other donuts then come back to Donatsu,” says Jenny laughing. You can find Donatsu tucked away in Little Tokyo, right off of 2nd street and across from the popular Japanese Village Plaza. The shop has a dark and sleek aesthetic because Jenny wanted it to feel like a secret spot. Jenny says the name, Donatsu, is their way of paying homage to their new home, Little Tokyo, by using the Japanese word for donut. And customers can’t seem to get enough of the colorful selection Donatsu is serving up. So let’s run through some of the popular flavors of these photogenic donuts! There’s the Ube one (purple yam) with toasted coconut shavings that’s so good and so popular they tend to sell out quickly. We really love this one because … um who doesn’t love Ube?!? Next, there’s the Crème Brûlée, with a classic torched sugar top with cream filling. There’s also a Matcha one, with crunchy pistachios and pretty rose bits scattered on top. But the one that really knocked it out of the flavor park is the one with crushed Biscoff cookies, you know the cookies your grandma probably had laying around the kitchen table, next to the Yuban coffee container … yep those. It’s crunchy and sweet in all the right ways without being too overwhelming. There’s also a delicious Churro one ... Mmm Churros! And the list goes on and on but we’re not here to spoil it for you. We’re just here to tell you to go and check it out for yourself. Just walk into Donatsu, order up one of their coffees and let your eyes scope out the selection until you land on the donut of your decadent dreams. Because what’s life without donuts … BASURA, that’s what.